There are not a lot of spells to make something smaller. Bigger, frequently makes more sense- if you’ve got a faithful dog, and you’re trying to intimidate someone, it makes much more sense to make the dog larger than to make it smaller. A small horse can carry almost nothing- a giant horse can carry an entire party! In many ways, most of the time, bigger is better! But when it comes to special treats or desserts, I tend to want something a bit more moderate, like these mini apple pies. I get creative when I have extra of an ingredient to use up. This recipe came about because I had ordered pecans from a fundraiser, so I was trying to find more uses for pecans. Also, I’d made vegan rangoons, but was still long on wonton wrappers. I was presently out of green onions and vegan cream cheese, so making more of those was out of the question! Add to that a few extra apples just begging to be used, and necessity gives way to invention. I decided to turn my wrappers into tiny pies, with a pecan crumble on top! I feel bad that I have no idea how well these keep- we made a dozen and ate all of them hot out of the oven! I had to rush them over to the window to get a picture of them before we polished them off! I don’t usually have a craving for many traditional dessert items, but I am a bit of a sucker for apple pie and crisp! This wound up being somewhere between the two! Combine sliced apples, cinnamon sugar, and salt in a bowl, let sit for 20-30 minutes if possible, if not, just keep going! 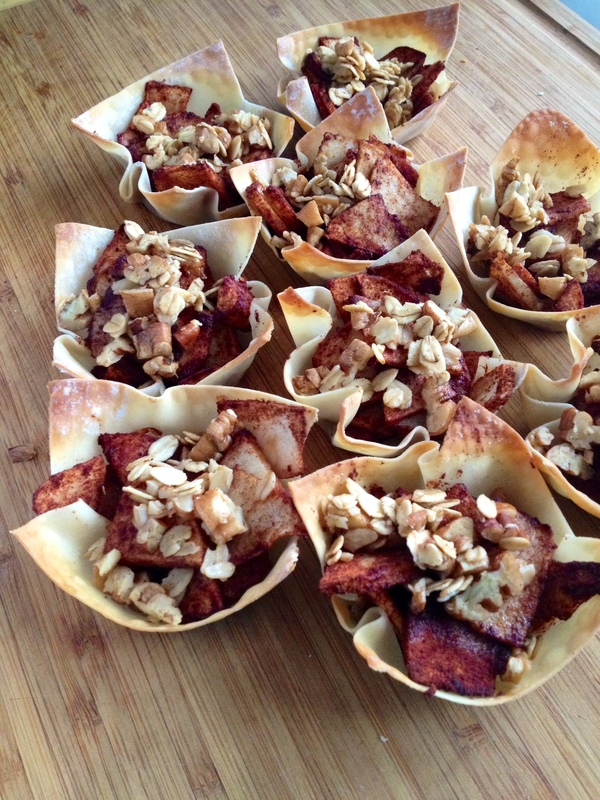 Fit wonton wrappers into the muffin tin, evenly divide apples between each wonton. Combine melted Earth Balance and maple, and using a brush, dab a bit over each pile of apples. Mix pecans and oats into what remains, and stir to coat. Divide oat and nut mixture over top of the apples in each wonton. This entry was posted in comfort food, dessert, simple and satisfying, snack and tagged comfort food, dessert, DIY, easy, healthy-ish, homemade, vegan. Bookmark the permalink.